We drove home from a lovely holiday in the Lakes on Friday and made the regular stop at the most middle class of services, Tebay. I was delighted to find a really good selection of vegan sandwiches and salads available. I was less delighted to find how much they cost… I can’t say their version of this was worth the £5 price tag, but it was tasty and inspired me to make this which we all scoffed, even the teen. Soak the noodles in boiling water for about 10 mins. Drain, run through with cold water and then squeeze out any excess water. Toss through 1 tsp sesame oil to stop them sticking and place onto the serving plates. Layer up grated carrot, beansprouts, shredded watercress, the sliced chilli and some roughly chopped watercress onto the plates. Combine all the dressing ingredients and mix. Add the remaining coriander, chopped quite finely to the dressing. Char the broccoli in a griddle pan until tender and lightly charred. Add to the serving plates. Slice the tofu into thin slices and heat in a hot pan until lightly golden and starting to crisp. Add to the plates, pour over the dressing, sprinkle over some extra sesame seeds and enjoy. Quick. Easy. Delicious. The perfect Friday night antidote to a full on working week and a craving for takeaway! The salad was homegrown too, our first harvest from our new greenhouse. Start by slicing the baguettes on the diagonal to make twelve slices of equal thickness. Slice the cheese into twelve slices. 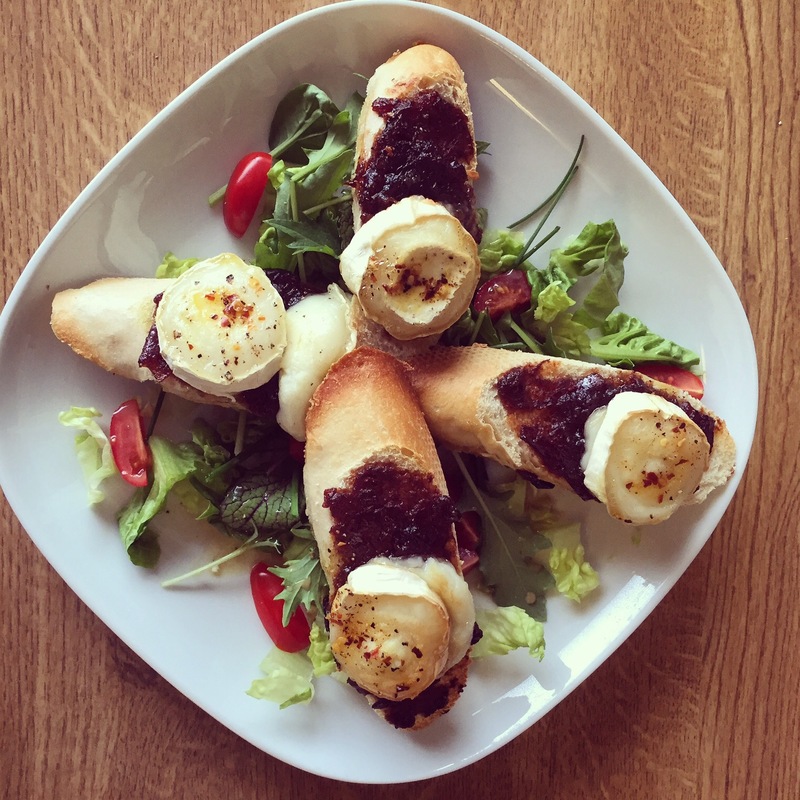 Spread 1tsp of onion marmalade onto each slice and top with a disc of cheese. Drizzle over a little oil and sprinkle with the chilli as hot as you dare! Bake in a hot oven for 12-15 min until the bread is crisp and brown and the cheese is cooked. Serve with salad and enjoy. 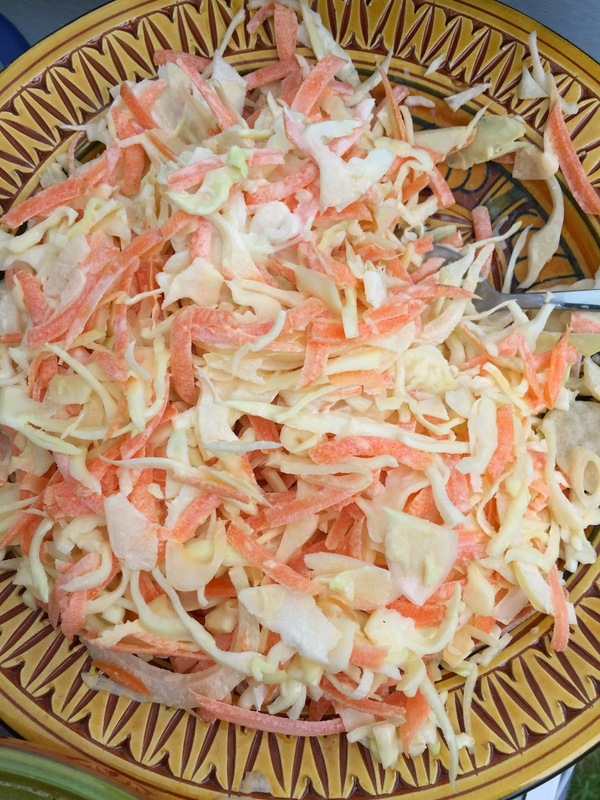 Very quick and easy to make if you have a food processor, this coleslaw gets better with age so make it 1-2 days beforehand if you have time. Shred the cabbage and onion then grate the carrot. Mix in the mayo. Told you it was simple. I have a large collection of cookery books. Some might argue too many. And often I admire them in my living room and then head to the kitchen to create something myself. But I am on a mission to cut my shopping bill in half, and to use up everything we buy along with getting out of the food rut we are currently in. My recipe book of choice at the moment is therefore River Cottage Veg Everyday as we are working our way through our weekly veg box and I am already bored with some of the contents (namely courgettes!!). This recipe is very easy to do and tastes delicious hot, warm or cold. 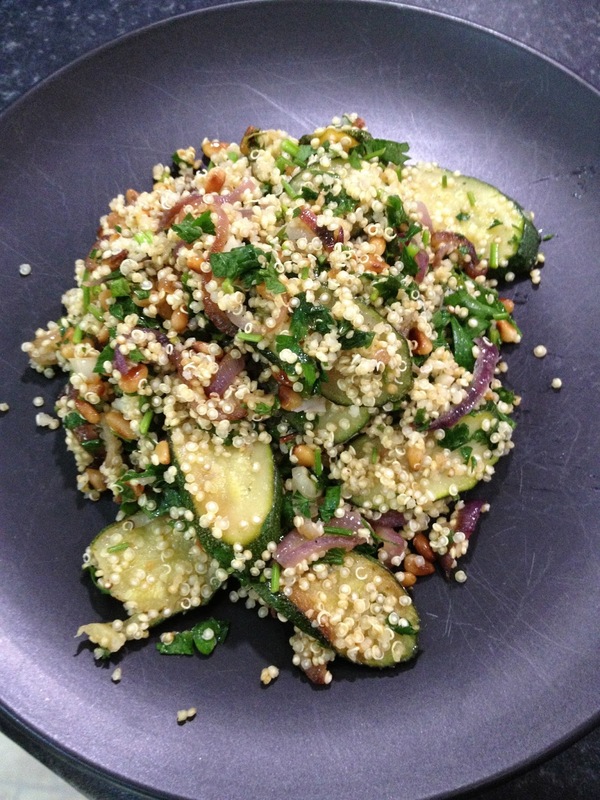 It makes a lovely light lunch on its own, or a yummy side dish. 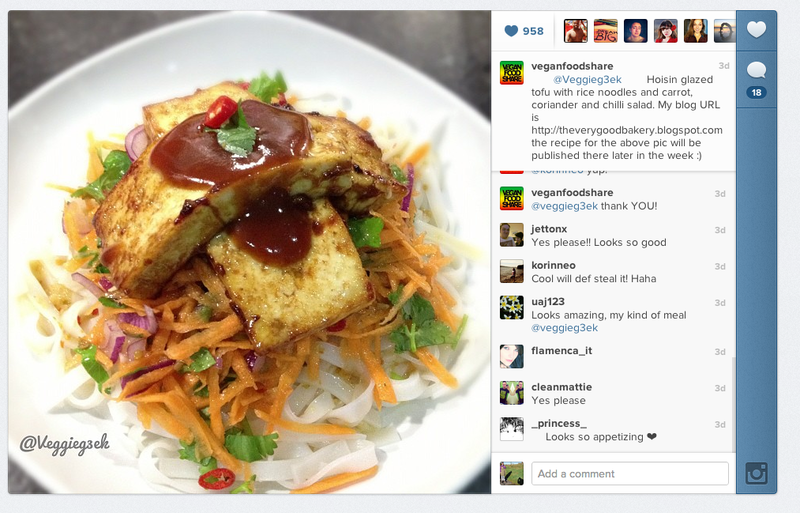 If you’re not vegan, add some feta to it for a salty tang. It’d also be delicious served up alongside a lamb cutlet or similar. Begin by sauteeing the thyme leaves, onions and courgettes in a pan with the oil. Keep the heat medium so that after 20 minutes or so the onions and courgettes are nicely golden. Add the garlic at this stage and cook for another 2-3 mins. Meanwhile cook the quinoa in 200ml of water. Bring to the boil and then simmer gently for about 8 mins. Turn off the heat and leave to steam until all the water is absorbed (about another 10 mins). Toast the pine nuts until golden. Toss everything together in a large bowl, season to taste and then eat hot, warm or cold. Nom nom nom. which is what I used tonight and it was the most authentic tasting one I have made to date. I just cannot get enough of thai food right now! Heat a wok and stir fry the protein in the water until completely cooked and hot. Add the packet of laab seasoning and mix well. 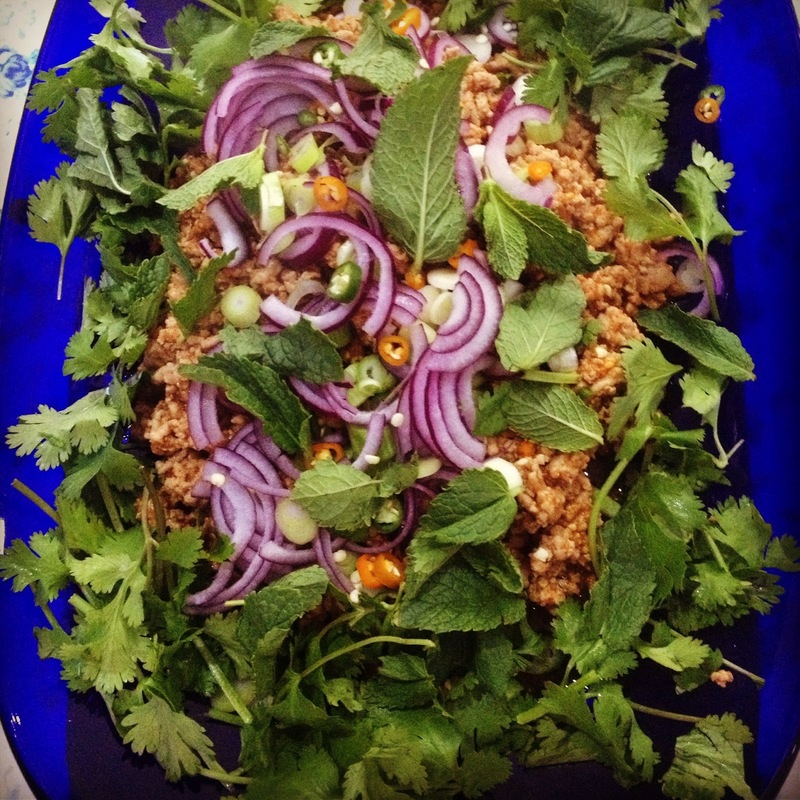 Turn out onto a serving dish and garnish with the shallot/onion, spring onions, chillies, coriander and mint. Serve with the rice and prepare for a taste sensation! I’m sure I have blogged this before, but blogger and google are coming up blanks for it, so in case I haven’t, here it is… This is the perfect accompaniment to a fiesty curry. It’s tasty, cooling and delicious. Thanks to my mum for the recipe! (the salad is in the top right of the very full plate!! 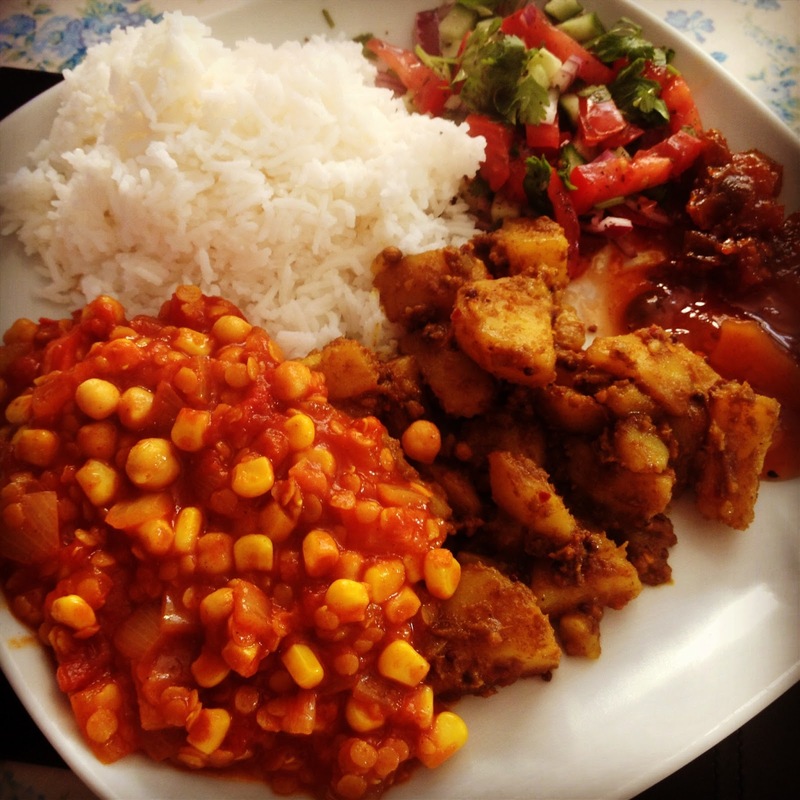 The other recipes are aloo curry and chickpea, red lentil and vegetable vindaloo. And Geetas lime pickle and mango chutney cos a curry isn’t a curry without those!). Place everything in a bowl and mix. That’s it! 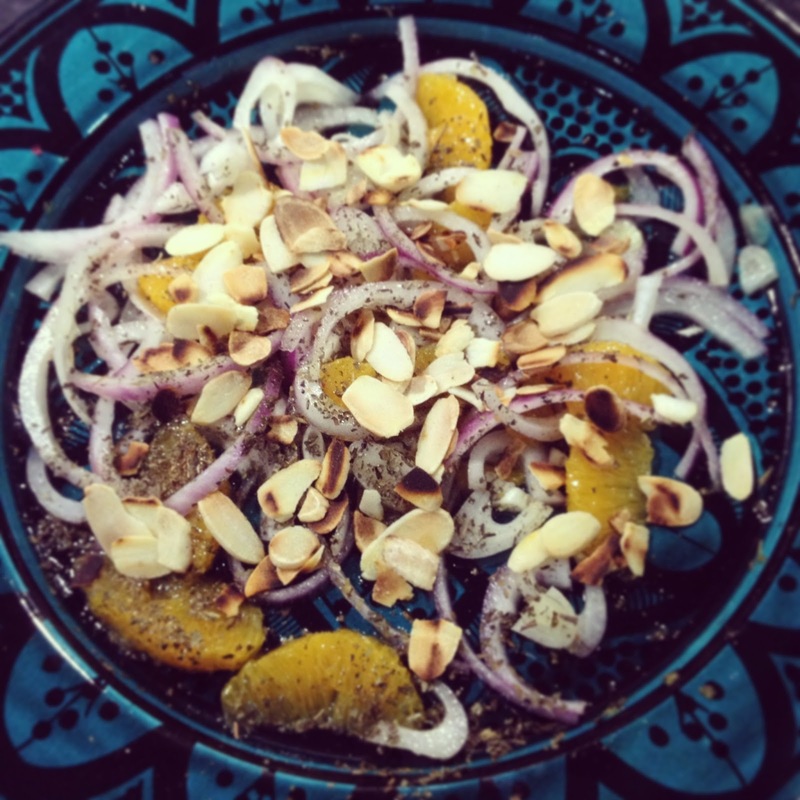 A lovely light fragrant salad which cuts through the richness of a tagine brilliantly or is fabulous on its own on a hot day. So not like the weather today then…! Arrange the ingredients on a plate and leave to infuse for 30 mins or so before serving. Serve at room temperature, don’t chill. My boyfriend didn’t believe that veggie black pudding would taste very nice, so I created this to prove to him it works. Even tho it’s a weird thing to make veggie! Slice the black pudding into thick rounds (you’ll get about 8 slices from one pack). Heat the oil and fry gently for 2-3 mins on each side until crispy. Meanwhile, poach the eggs on simmering water which you have added the vinegar to. Whisk all the dressing ingredients together until emulsified. Season to taste. 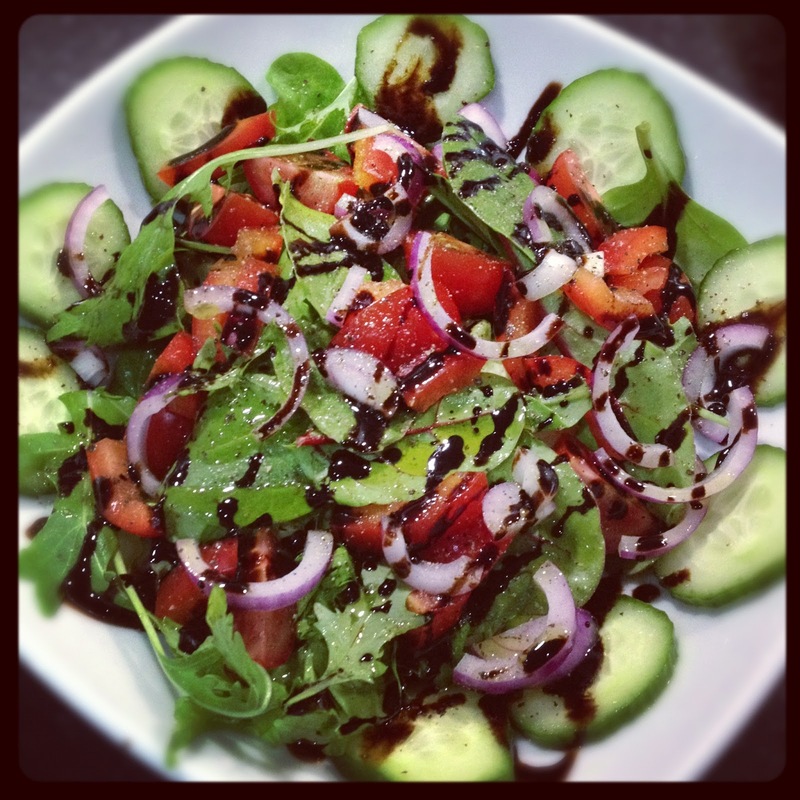 Arrange the salad leaves on a plate and scatter over the croutons. 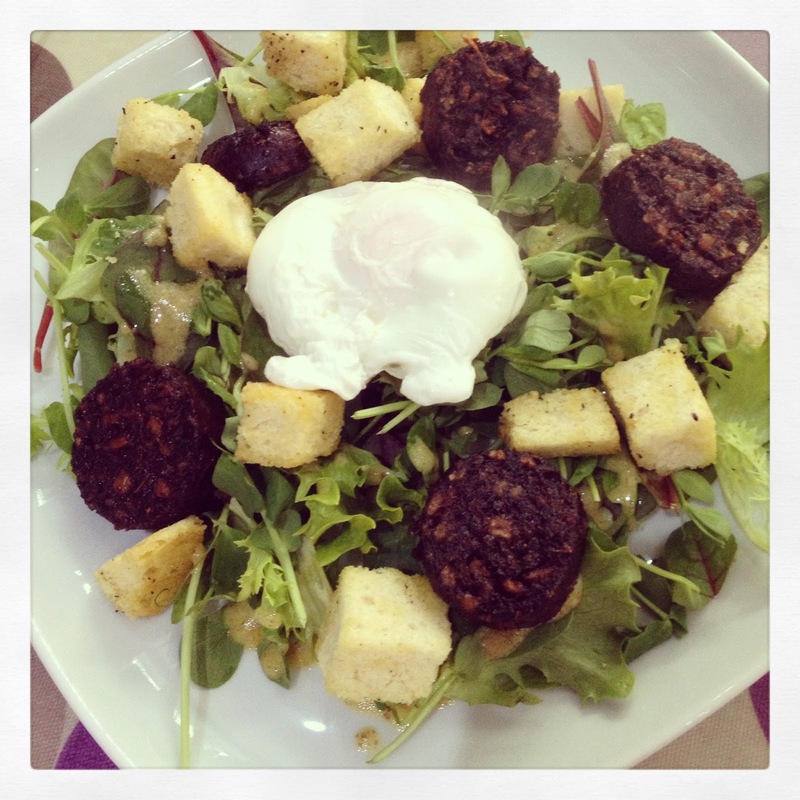 Place the fried black pudding and egg on the leaves and drizzle over the dressing.